Lasseter -Damaged according to recovery personnel. Extent of damage is unknown because it was not appropriate for me to drive down the very narrow lane with recovery efforts going on. Signorello Estate – destroyed according to owners. 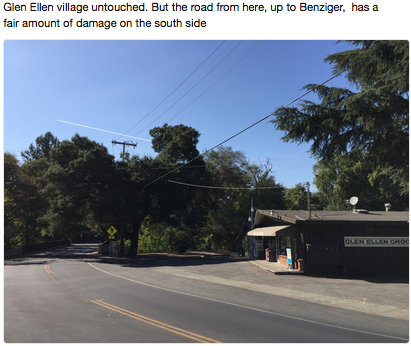 Ancient Oak Cellars – Via facebook: The Ancient Oak survived but substantial damage to wine facilities. Roy Estate – WII sources who have been reliable in the past. Not independently confirmed. 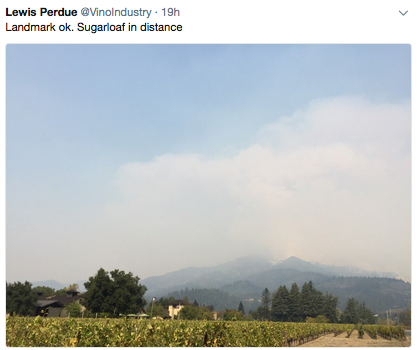 Kenzo Estate – Email -“The winery and vineyards did not sustain damage from the fires. 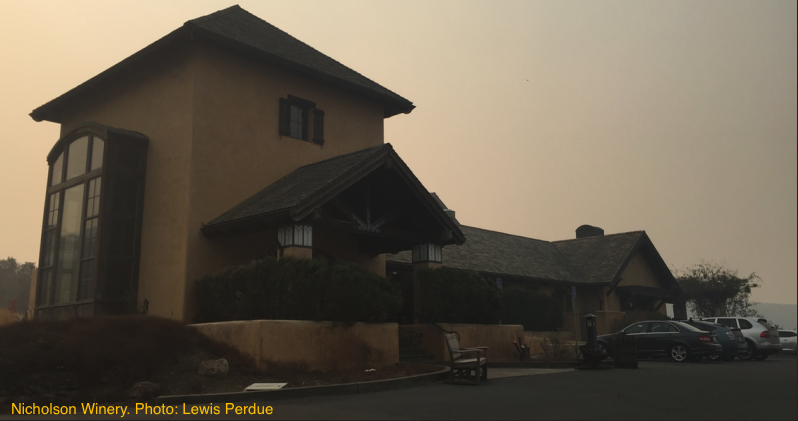 Sadly, the fires did reach some of the outlying areas on the estate, including some of its vast landscape and a guest house. 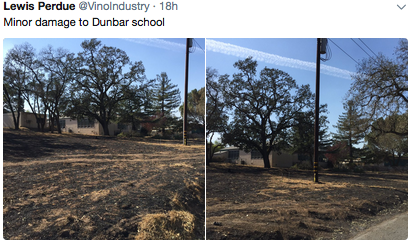 The vineyards fortunately remained relatively unscathed—and actually served as a natural fire break, preventing additional losses. Imagery Estate – Mostly intact – OK: WII on-site inspection showed some structure damage. 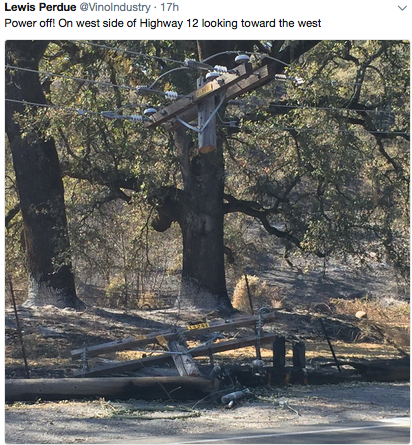 Tom Eddy Winery – mass email to supporters: “At this time we are one of the few ranches in the area whose home is still standing. 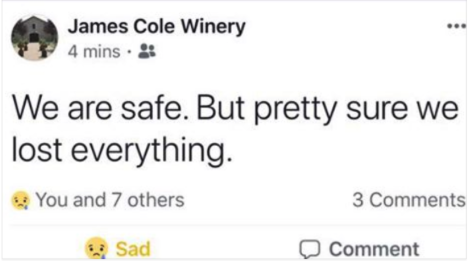 The winery has seen some damage. Thank God for the cave! We will rebuild. 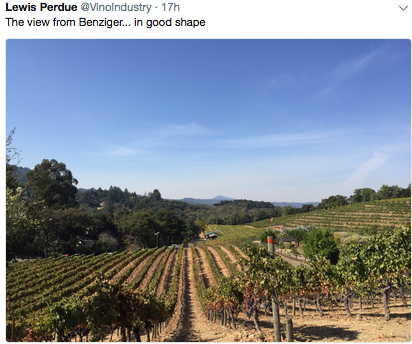 Although most of the new wines from the 2017 vintage were impacted, almost our entire inventory of agingbottled wines in south Napa were untouched. 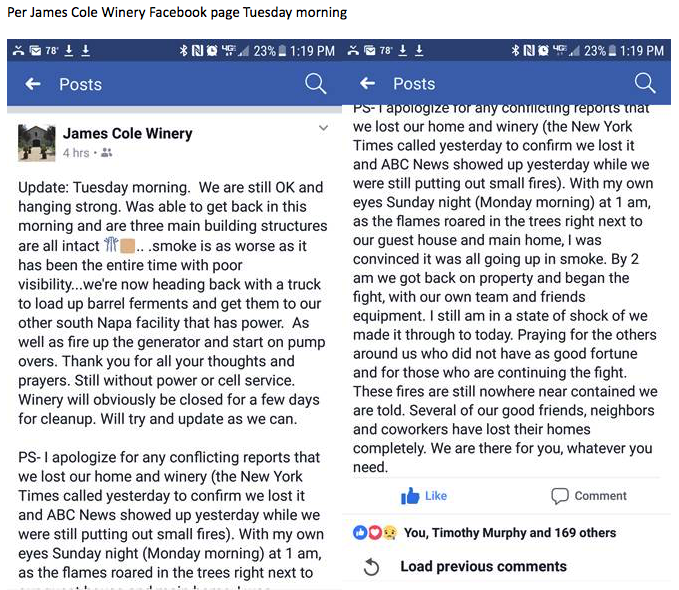 Vinify Wine Services – Email: ‘Our facility is located about 2 blocks from the devastation in the Coffey Park neighborhood, but was untouched by the fires. 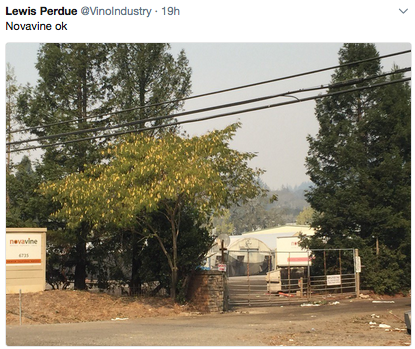 We lost PGE for about 5 days, but had a generator hooked up within 48 hours of the initial outbreak of fires. The neighborhood is locked up tight with national guard and police, but we have been able to get through to our winery with business cards and IDs. Shadybrook Estate – Email: “Close call but we are okay so far. 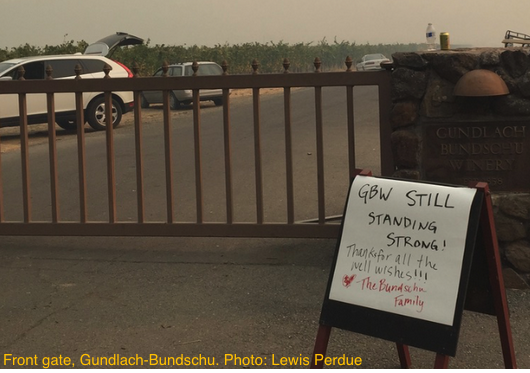 With the help of fire fighters, volunteers and our vineyard crew, Shadybrook Estate was able to keep the fire away from the vines, winery and residence. Thankfully our staff and their families are safe and out of harms way as well. The horses were also emergency evacuated safely early Monday Morning. Black Knight Vineyards – Ok: WII visual inspection. The Caves at Soda Canyon – Caves at Soda Canyon: singed but no major losses according to a staff member email. 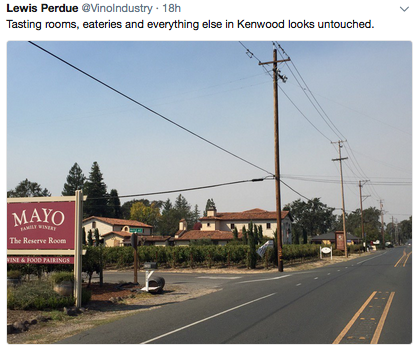 Tasting rooms in village of Kenwood as well as all other commercial buildings. 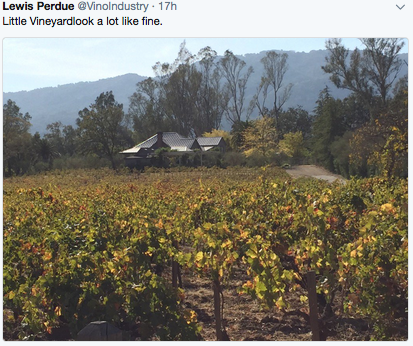 Loss of homes next to vineyard immediately south of St. Anne’s Crossing (may have stopped fire from reaching winery.) – OK: WII on-site inspection. 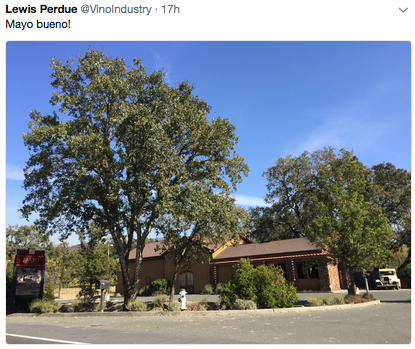 All wineries and businesses on the west end of Adobe Canyon Rd. from Hwy 12 to where the narrow road to Sugarloaf State Park begins – OK: WII on-site inspection. B.R. 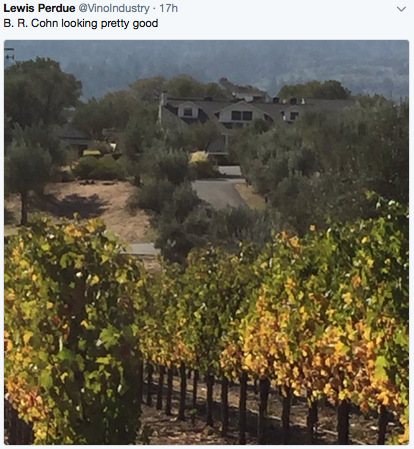 Cohn – Winery is still standing according to owner, Vintage Wine Estates. All other VWE wineries fine OK: WII on-site inspection. 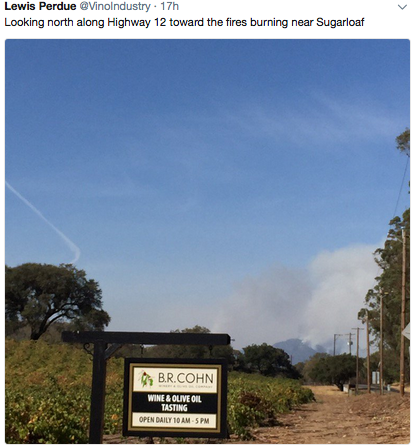 Relic Wines – “We were able to make it up to Relic today and it is amazingly, almost completely unscathed. The wines are in great shape. Most of our neighbors suffered horrible losses, and we feel for them deeply.” More plus video at their Facebook page. Arrrowood – OK: WII on-site inspection. 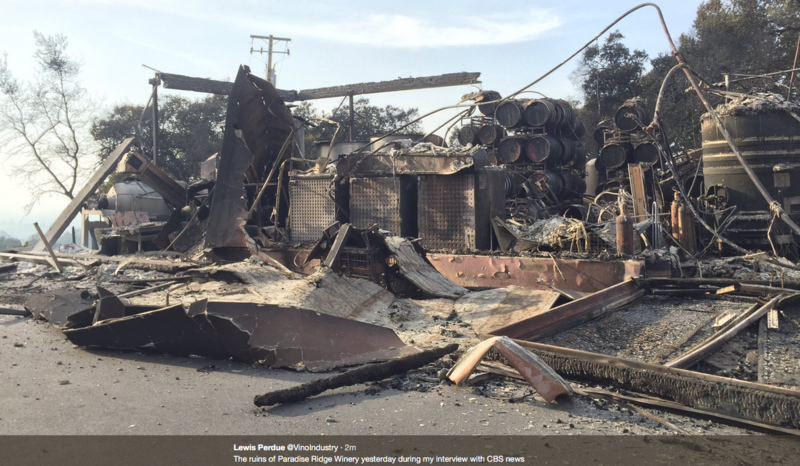 Chateau Montelena – Facebook: “Chateau Montelena Winery and Calistoga survived another potentially dangerous situation with winds overnight on Friday. 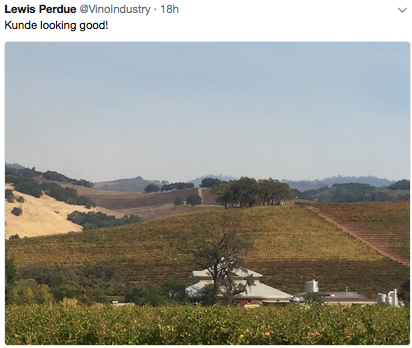 Ledson Winery – Television images on afternoon of 10/14 show it in good condition, but with flames on the hills close by behind it. 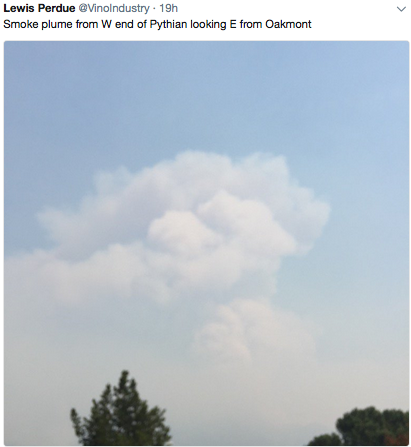 Novavine: Email from Alexandra Kicenik Devarenne – “Is dusted with ashes and in an evacuation area, but still standing! Skeleton crews have been watering and our cold storage is still… cold. There are fires nearby so we’re not done with this by any means, but so far, so good! Scribe: management says successfully fought to avoid damage – no damage apparent during WII Visit. 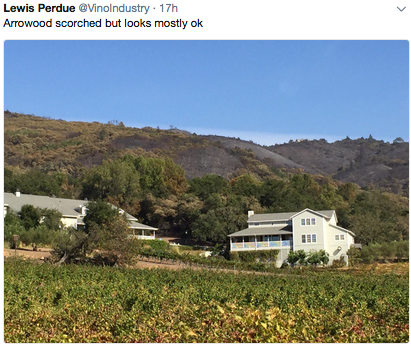 Kunde Estate – Email from staff: ” Our property has sustained some significant burn damage but overall we have fared pretty well. 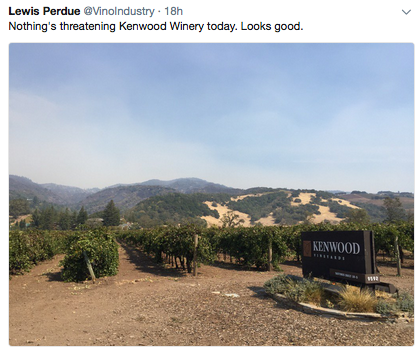 Kenwood Winery – OK: WII on-site inspection.. Also, Email from employee at another Kenwood winery: “Kenwood winery appears to be ok. The fire up behind both the wineries yesterday was pretty brutal but Cal Fire came in like rock stars and knocked it down with some incredible helicopters. Welfare check = All good! von Strasser – Email from staff. Villa Ragazzi – Email from owners. Sunce – OK: WII on-site inspection. Westwood Winery – OK: WII on-site inspection. 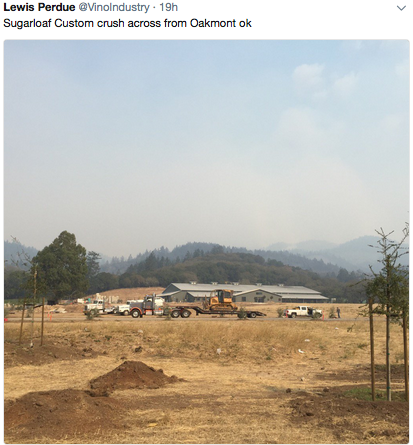 Sugarloaf Custom Crush – OK: WII on-site inspection. St. Francis – OK: WII on-site inspection. St. Anne’s Crossing – OK: WII on-site inspection. Landmark – OK: WII on-site inspection. Loxton – OK: WII on-site inspection. Wellington – OK: WII on-site inspection. Valley of the Moon Winery – OK: WII on-site inspection. Little Vineyard – OK: WII on-site inspection. Mayo Winery – OK: WII on-site inspection. Benziger – OK: WII on-site inspection. Also see Twitter feed screen caps below. Kivel Stadt – OK: WII on-site inspection. Deerfield: Email from Pres Addison Rex “OK. Lucky so far. no power. PLEASE! Help fight fake news! Email Wine Industry Insight with confirmed information about the status of wineries and other industry-related structures. Confirmed means you are the owner or associated directly with a property OR you have a photo OR a link to an OFFICIAL Facebook, Twitter, or web page. Please do not send links from other sources including media reports which have often proved to be incorrect. WII must be able to independently verify from original sources. 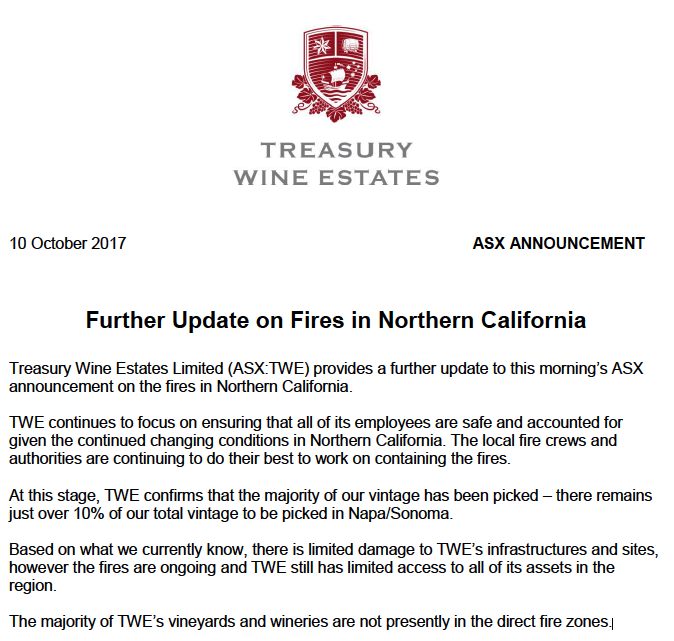 Among the missing, status unknown: We also have a list of wineries thought to be in the fire danger zone, but whose status remains unknown. Please Email if you have any confirmed information. 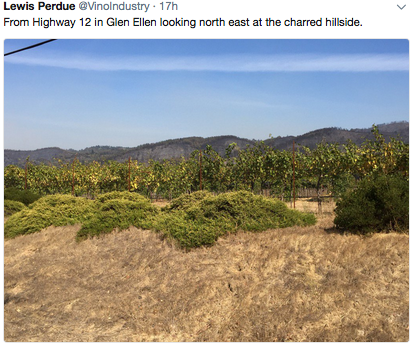 This Sunday afternoon (10/15/17) Twitter flurry of winery status updates were made possible by the cooperation of the Sonoma County Sheriff’s office. 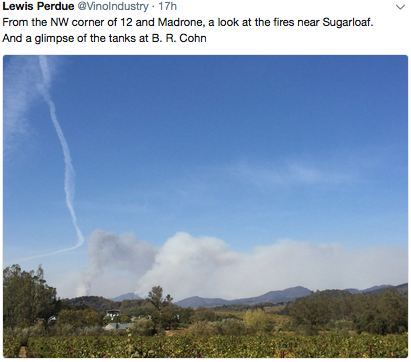 Click here to go to Twitter flurry from @VinoIndustry and view larger images. Chateau St. Jean goes all vague on us. “Limited” covers a lot of ground.